Hey, guys! I hope you’re having a good week. I can’t believe it’s already Thursday! Do you have anything exciting planned for the weekend? We’re going to Party in the Park which is a concert/party and Ludacris is performing! Summer is flying by so make sure you get out and do what you wanted to do! I am super excited for fall though, anyone else? Anyways, today I am sharing my brow routine lately because I’ve been obsessed with some Benefit brow stuff. What’s your favorite brow products? Share in the comments here or on Instagram! 1 // First I start by combing and outlining my brows with the skinny pencil, Precisely My Brow. I love that the pencil has a spooly brush on one end so you can easily comb and blend the pencil lines after too. 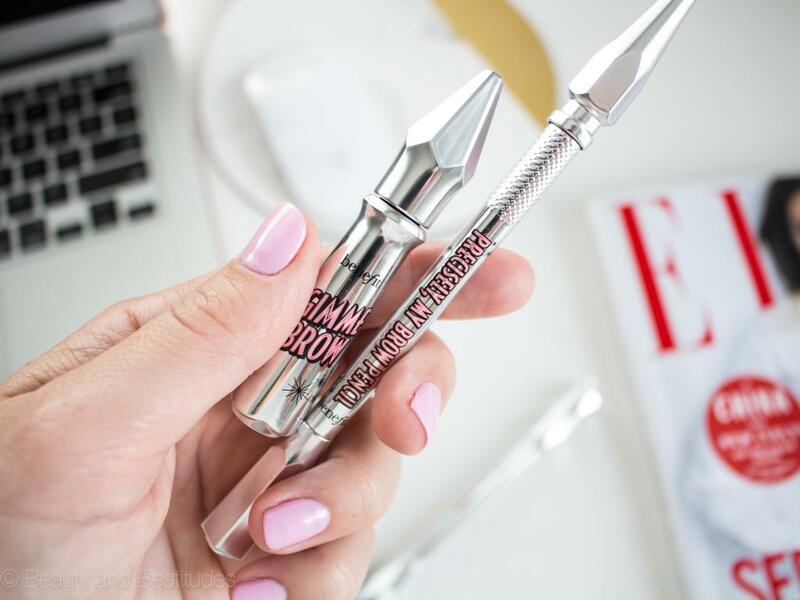 2 // Then I use the Gimme Brow which is a volumizing brow gel with a tiny brush. It grabs all the tiny hair and plumps them up while looking natural still. This is a great product to use alone if you just want to comb, fill, and volumize what you have without perfecting the shape. My other favorite pencil is the Goof Proof pencil because it makes it super easy to use with the triangle shaped tip, you can get a thin or thick line. This one also has a spooly so you can blend and comb after! Another one I love and use instead of the Gimme Brow is 3D BROWtones which is like a subtle highlighter for your brows. It gives me dimension and looks really pretty. If you love the look of bold brows then you will love ka-BROW! which is a cream-gel that you apply with the built in brush. The formula is waterproof so it’s super easy to wear all day. Thank you SO much for reading! Have a fabulous weekend!